One point that Cook emphasized was the different view Apple takes with regards to data and users, attmempting to make a clear distinction between Apple and other technology companies. He added that Apple set the industry’s highest standards and spoke about Apple Pay, discussing the importance of security and its integral role in the product’s development. 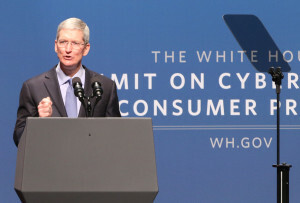 He announced that starting September of this year , Apple Pay will be available for transactions with the federal government. “[We are] working on initiatives to use this technology with [government] benefit programs,” he added. Cook closed by underlining the importance of collaboration and information sharing between government and the private sector.